Fascination with beauty and the search for the fountain of youth is as old as the beginning of time. Young Living's "Young" elixir, Sheerlume', combines ancient botanical wisdom with cutting-edge science to visibly brighten and even skin tone. Research suggests that an "older-looking" face is not defined by the depth of wrinkles but by the other signs such as age spots, skin dullness, and rough textures. 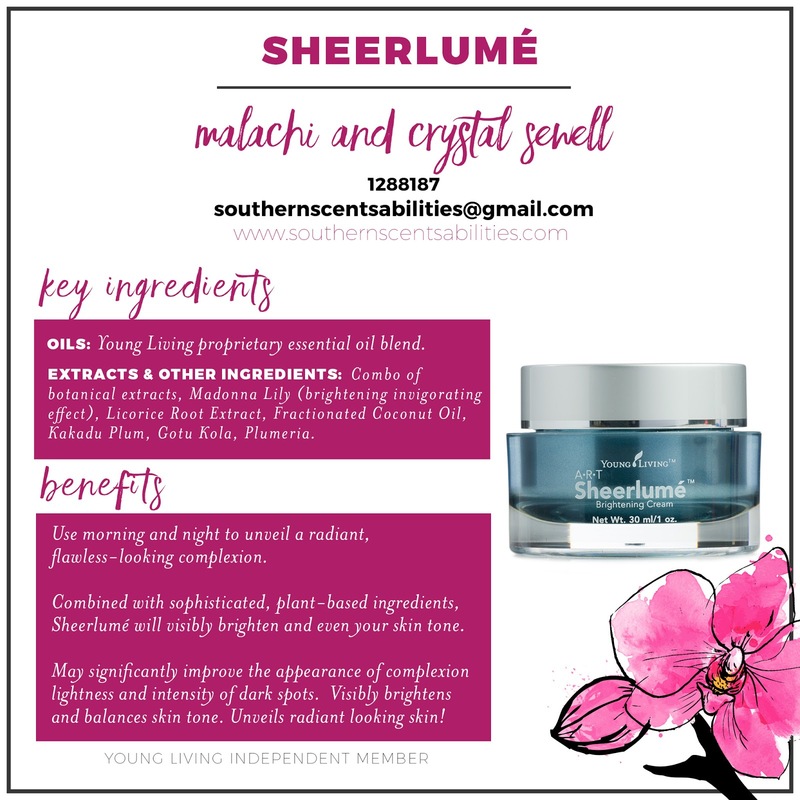 Sheerlume' optimizes any complexion with a unique, proprietary blend of alpine plant extracts and carefully chosen essential oils that function as a barrier from external stressors that can add years to your ace. With daily use, Sheerlume' can unveil your radiant, flawless-looking appearance. Bringing your complexion into light is as easy as applying Sheerlume' morning and night! 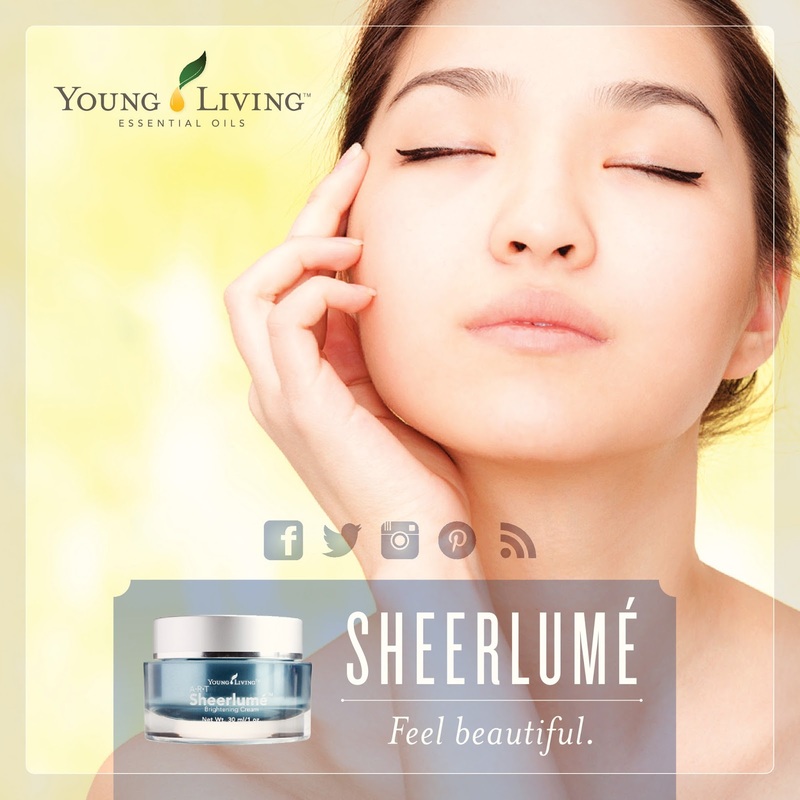 Sheerlume' is my FAVORITE Young Living Skin Care product! I love, love, love - did I say love? - this rich and creamy brightening cream on my face. I put this on after I use the ART Light Moisturizer OR instead of using it. I just love the way this cream feels and smells. So super luxurious! Sheerlume' contains incredibly nourishing ingredients, like Vetiver, Clove, Carrot, Blue Cypress, Elemi, Geranium, Spearmint, Davana, Jasmine, Melissa, and Idaho Tansy Essential Oils (see...super fabulous), Fractionated Coconut Oil, Proprietary Blend of Alpine Plants, Madonna Lily, Gotu Kola, and Kakadu Plum. SUPER INCREDIBLE INGREDIENTS! I use Young Living's Sheerlume' EVERYDAY! I just love it. Now, with all the information on products to help support the health of the skin on your face, how do you know what you should use? Remember the post that I shared the different skin types? In my next post I will share some basic Skin Care Protocols that match those skin types. You can use them as a *guideline* for creating your own skin care regimen.